Ah, Hawaii, the vacation destination that’s got a touch of everything: surfable waves, luxurious accommodations, blue waters, American National Parks, culture, great food, shopping. You name it, this idyllic state has it. That’s why more than 1.5 million tourists visit the Big Island almost every year. In fact, if you’re looking to book a vacation rental with amenities like a swimming pool and large game rooms for your family and friends, it’s time to start researching today so you can avoid the crowds of other visitors. Here’s a guide to finding the best vacation rental with plenty of perks to make your stay in paradise memorable. Most people venture onto Oahu or Maui during their first trip to the Hawaiian islands, but if you’re looking for a unique experience with fewer crowds, it’s probably a good idea to book your stay on the Big Island of Hawaii. It’s by far the largest piece of the state, and it’s filled with breathtaking views and lots of diversity. There are two major sides to the Big Island: Kona (west) and Hilo (east). In general, most visitors tend to stick to the Kona side because that’s where most of the popular attractions (and Hawaiian vacation rentals with private swimming pools and special features) are located. But don't worry, if you're looking for volcanic adventures, there are volcanoes sprinkled all over the island, too. As you investigate the accommodations on The Big Island, you’ll probably stumble across your fair share of hotel and rental options. However, if you have to choose between the two types of housing, the most affordable and enjoyable tend to be the vacation rental option. Vacation Rentals beat hotels in several different departments according to Island visitors. Firstly, most people enjoy the fact that you get much more privacy with a vacation rental than you would with a large hotel full to the brim with fellow tourists. 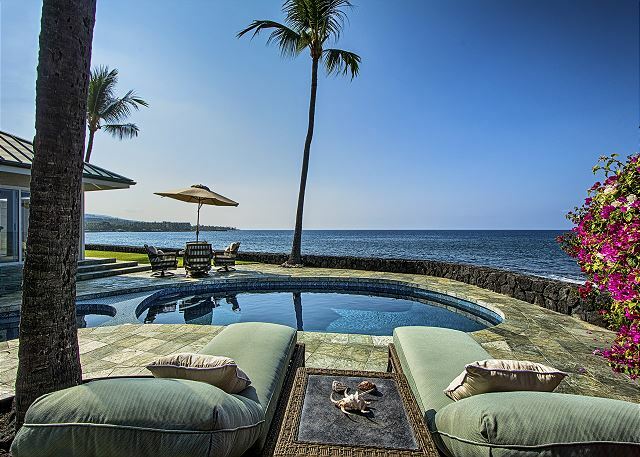 Many of the most desired Hawaiian vacation rentals with private pools come with plenty of space. Forget sharing a pool or porch view with eight other families and enjoy the privacy of a vacation rental property. Furthermore, vacation rentals are fantastic options for people who need plenty of bedrooms. Instead of booking three separate hotel rooms for your whole family, let everyone stay in one house and split the bill. You’ll have more room to spread out and will easily stay comfortable for the duration of your vacation. 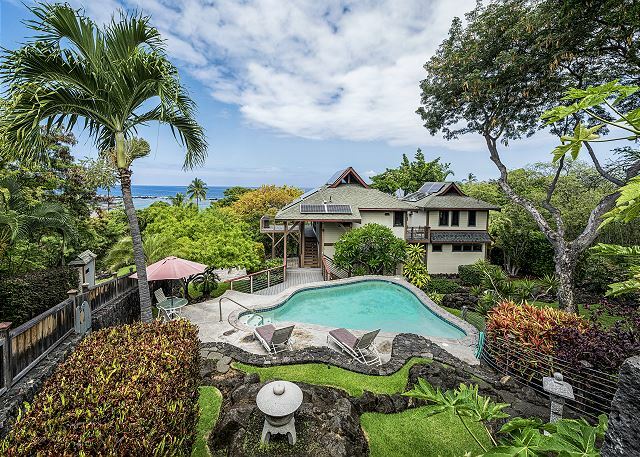 Additionally, vacation rentals are often more unique than the hotels that are available in Kona or the rest of the Big Island. You can find treehouse accommodations, beach-side houses, and condos to rent, and each one of them will be a little bit different. Visit Hawaii time and time again to experience a different sort of accommodation on each trip. With an oceanfront view, elegant decor, and room for ten people to sleep, this bungalow is ideal for a family with plenty of children. The private pool can fit plenty of people and is located right outside the windows, which makes keeping an eye on young swimmers easy. There are three and a half bathrooms, so people won’t constantly be fighting over space, and the price is great for the amount of space and amenities this rental offers. Splitting with a small group would easily be more affordable than getting a hotel room! Looking to splurge a little? Well then, a vacation in Hawaii is the place to do it. Drool over this: 5 king-sized beds, a private pool, in-home movie theater, and oceanfront luxury. This stunning rental is calling your name, and maybe the names of your nineteen closest friends since it can sleep so many. Located next to a variety of activities like snorkeling and surfing, this beachfront property is full of special accommodations. Enjoy exceptional views, a hot tub, a BBQ grill, multiple flat screen televisions, and so much more. Not ready to spend a month’s worth of paychecks on just one night on the Big Island? Consider this more cost-effective option located a few minutes away from Kahalu’u Beach Park. It can sleep up to six people, has television and WiFi, is walking distance from one of the best snorkeling spots, and comes with its own porch and private pool. Who says you have to pay an arm and a leg for Hawaiian luxury? This entire elegant home is actually much cheaper to rent than most single hotel rooms on the island. 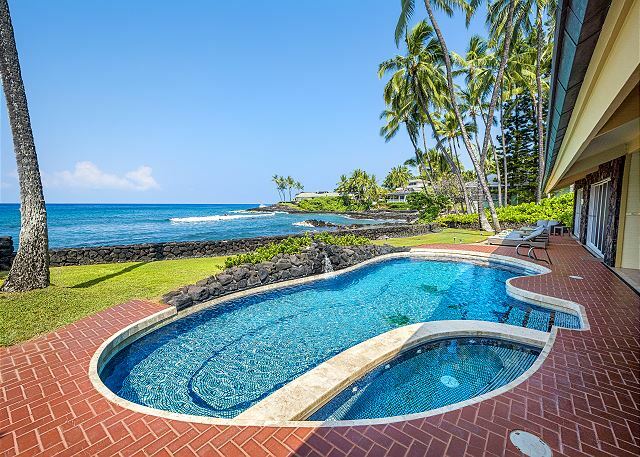 Visit boundlesshawaii.com to view more incredible, Hawaiian vacation rentals with private pools on the Big Island of Hawaii. Whatever your needs are, our vacation property options can accommodate them.